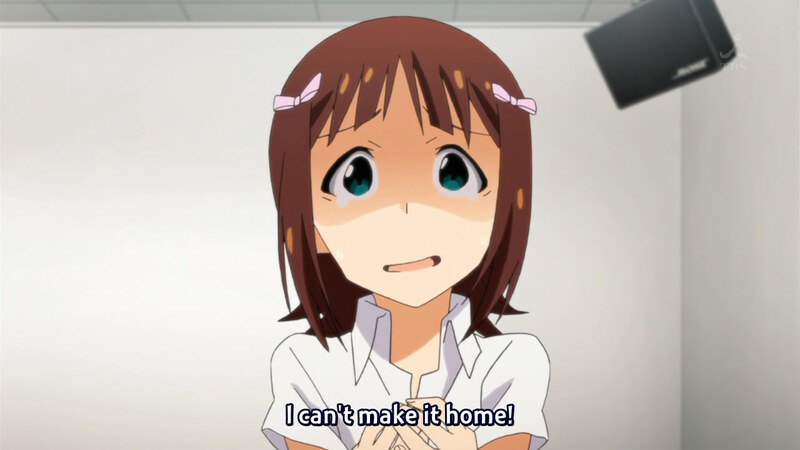 With this episode, I'm all caught up on this anime. With the way this one ended, I'm looking forward to the next episode - just a little bit, though. This anime is still only so-so for me. 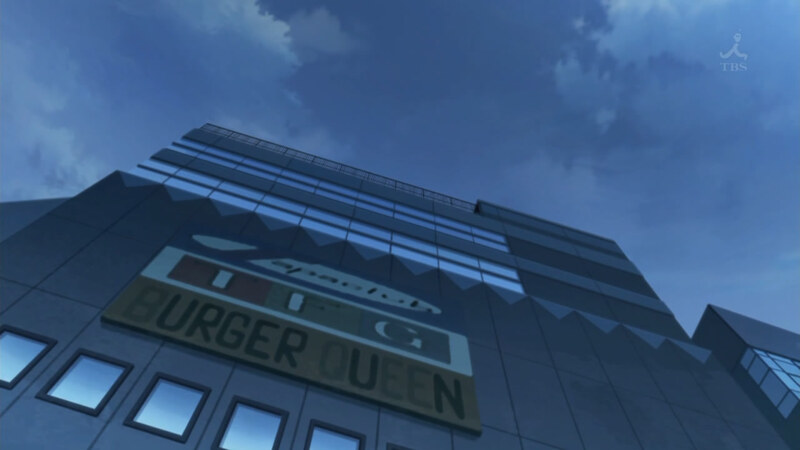 This episode was focused on Haruka, evident from the first moment when she walked in through the doors of the office in her school uniform. The story was that the president had decided to hold a concert consisting of the 765 idols, with the main attraction being Ryuuguu Komachi. As Producer broke this news to the girls, it came with new songs and new dance routines, leading to an episode full of Haruka trying hard. I can only focus on the giant heart. The girls began practising, though it was very difficult from the very beginning. Yukiho and Yayoi both had serious problems learning the dance routine, with Haruka having minor timing problems (that could turn into bigger problems, I guess). During a conversation between the dance instructor and Producer, Miki was against making the routine easier, since then the girls wouldn't be performing at their best. 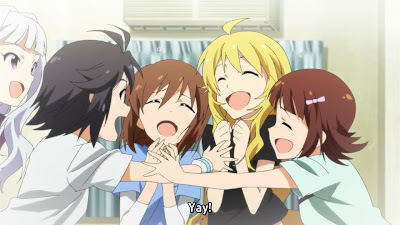 Slowly but surely, the other girls agreed and split up into three teams to help the three "problem idols". Is that guy looking at her book?! The singing also did not seem to go in Haruka's favour (though Mami seemed to have problems too). 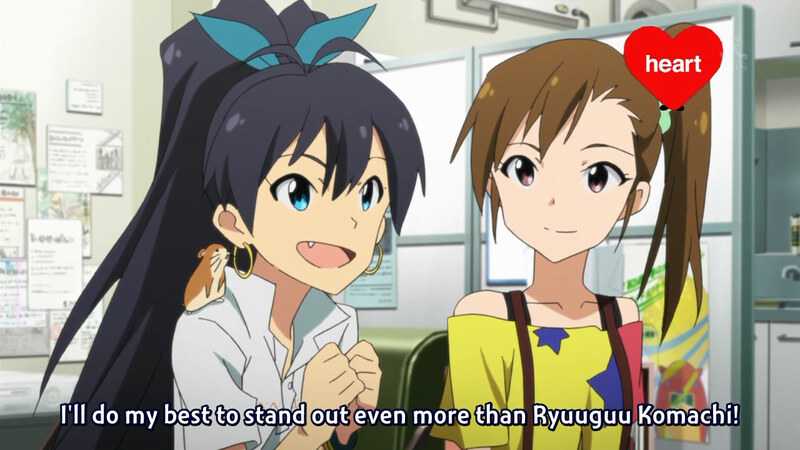 I wonder what her actual affinity is, with being an idol. 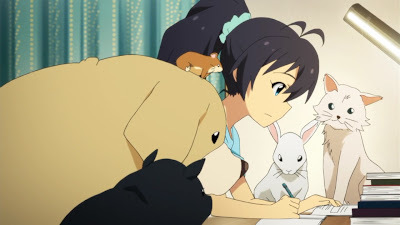 As the girls spoke after practice, Haruka asked everyone else how they were studying for their exams, leading to the understanding that she was trying to do well in school alongside with being an idol. A montage of her trying hard ensued, along with her insert song. 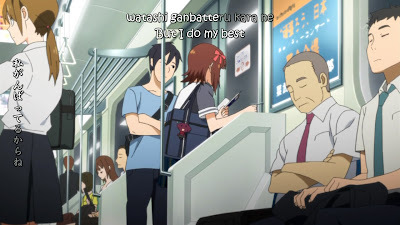 Once again, they showed an anime character studying anywhere and everywhere. Does that really work? I mean, the Japanese curriculum is very memorization-based, so I can't see how studying in bits and pieces like that can always work. What a terrible rip-off of Sony. The montage of a hard-working Haruka ended with her being so sleep-deprived that she fell during dance practice and hurt her ankle. Staying away from the usual shtick, it wasn't any kind of serious damage. 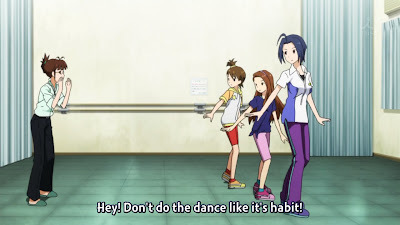 However, Yayoi also messed up in her dancing (while Makoto treated Haruka's ankle), leading to the dance instructor conversing with Producer once again to make the routine easier. 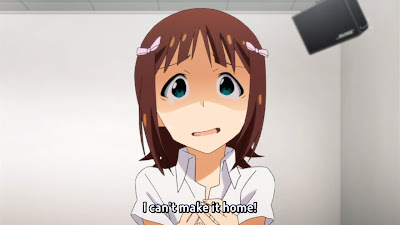 Yukiho talking about not being in the concert, so that she wouldn't drag everyone down, led to Takane speaking up and chastising her (and the girls as a whole) for not having the resolution to break through their personal barriers. Her straightforward words and unconventional way of speaking injected the girls with some more confidence. They don't get a dance instructor? The girls dropped by the nearby rehearsal studio where Ryuuguu Komachi and Ritsuko were, astounded at what they saw. I have to admit, the three girls of Ryuuguu Komachi seem quite adept at what they do. I'm sure it's because of the extensive practise they've undergone in the last few episodes (spanning a long time, I assume). 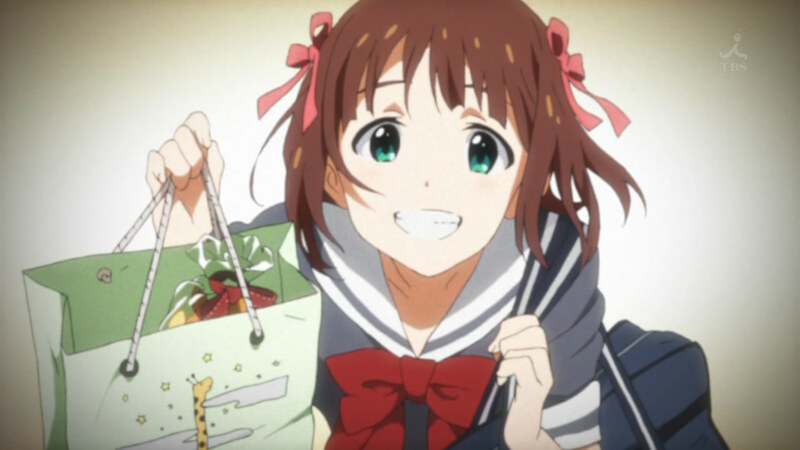 Takane called it "awareness of the responsibility of being an idol" and just as the girls seemed down again, Haruka gave them confidence by honestly saying that she wanted to hurry up and get to their level already. I guess it's really easy to lose confidence, considering how many times it happened in pretty much the same scene. That actually is kind of a scary thought. Since Chihaya was also there and probably more so because she lives alone, she offered to let Haruka stay for the night. They ended up cooking the dish they had cooked a few episode back, during the TV competition, after Chihaya commented that she usually ate from the convenience store and took supplements to make up for lacking nutrients. 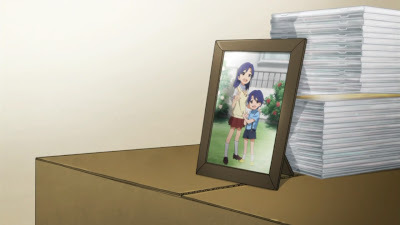 This scene revealed a lot more about Chihaya than Haruka, I think, since we found out that Chihaya's parents recently divorced and she wanted some distance from them. The picture shown revealed more still - not only does Chihaya have a younger sibling, but she obviously is very close with him/her. (I think it's a boy, but can't be too sure...) It may not be the only photo she has, but it's the only one she's unpacked; everything else is "essential", like her CD player. I wonder if Burger Queen is married to Burger King. Another montage (though this time without a song) followed, of all the girls that night and the various things that they did. Chihaya and Haruka talked about why the latter was an idol (although this question was kind of already answered back in ep01) as the two of them studied for exams. The next day at practice saw a marked improvement in all of the girls, considering they had actually been able to get through the entire dance routine without any major mistakes. Haruka also ended up doing well in her exams, so it all ended well. Those are some smart animals. Well, actually, there was one more matter. It had been shown earlier in the episode, when Producer was first announcing the concert, but I hadn't really thought it was a big deal. Miki has been commenting for a few episodes that she wants to be a part of Ryuuguu Komachi, and she mentioned that her good performance in the concert would help. 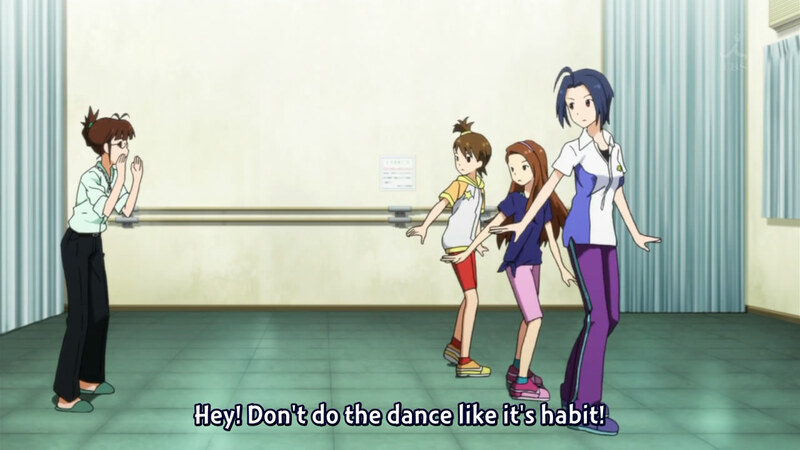 At the end of the episode, seeing that Ritsuko was present to see the properly-executed dance routine, she ran out to ask if she could be a part of Ryuuguu Komachi. Obviously, Ritsuko had no idea what she was talking about, mostly because Producer had half-heartedly spoken to her about it back then. 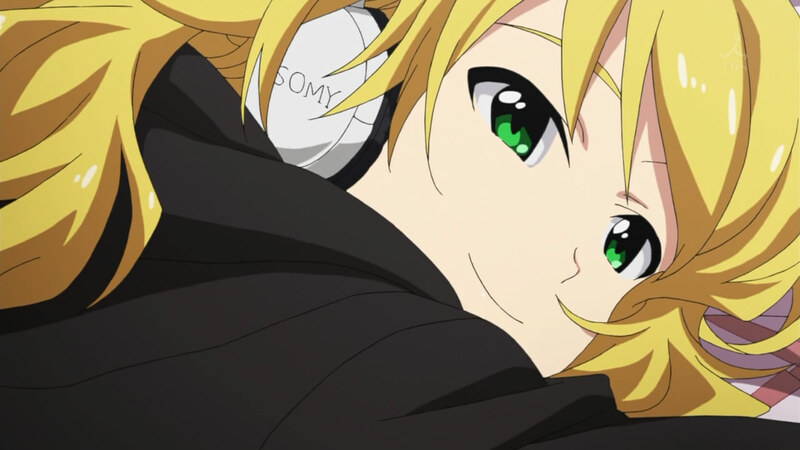 I don't know how I feel about Miki at this point. I have little sympathy because, as the viewer, I knew that Producer was only talking half-heartedly. I feel like she should have also asked Ritsuko for confirmation instead of going on one man's words. However, on the other hand, Producer is supposed to be in charge of her career, and so she obviously took it very seriously. 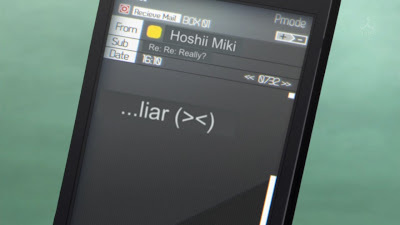 Moreover, seeing the subject of her text, it seems as though Producer had more communication with her about this matter rather than just what was seen on screen. Judging from what the other idols were saying, she was working harder in the last little while, with a goal in mind. I don't think that's reason enough to stop coming to work without a word, though. It was a quick episode with less happening than in the last (or maybe I just felt that way, because I don't like Haruka and most likely zoned out). The next episode obviously needs to deal with the issue of Miki, especially given that the all-important concert is coming up, so it's something I'm looking forward to because of the reality involved.